Shown above are a collection of crystals found on Sebago Lake in Maine. The lake froze on the last day of 2013. In the early morning of January 1, 2014, after the temperature dropped to -8 F (-22 C), I photographed these lacy hoarfrost crystals atop the new layer of ice. 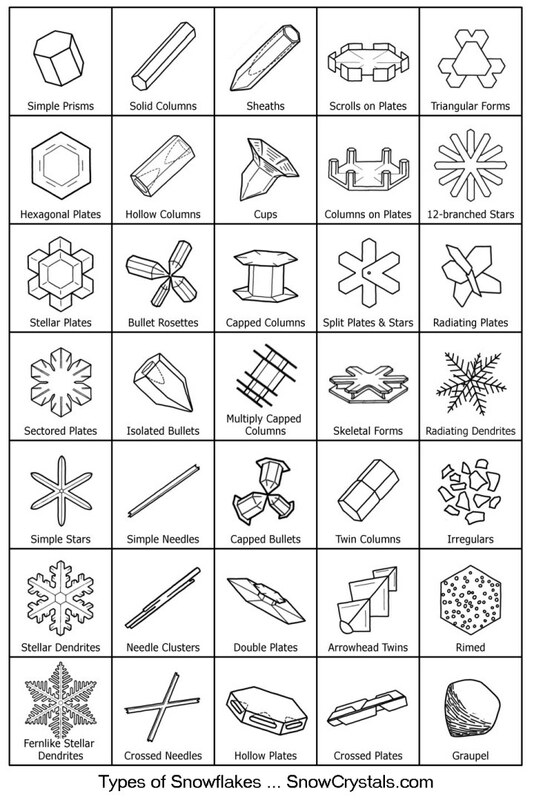 These crystals all have a hexagonal shape, but their form (dendrites, plates, columns, needles) largely depends upon the temperature and humidity (saturation) conditions. Hoarfrost or riming forms when supercooled water droplets, typically from a layer of fog or wind-blown spray, come in contact with objects at temperatures below freezing. If the fog is thick or spray persistent, layers of rime will continue to build. Note also the perfectly formed snow crystals (star crystals) at bottom right center of the top photo. Photo taken on January 1, 2014. Photo details: Top - Camera Maker: Apple iPhone 4; Focal Length: 3.9mm (35mm equivalent: 35mm); Aperture: f/2.8; Exposure Time: 0.0073 s (1/137); ISO equiv: 80. Bottom - Camera Model: NIKON D300; Lens: AF-S VR Micro-Nikkor 105mm f/2.8G IF-ED; Focal Length: 105.0mm (35mm equivalent: 157mm); Aperture: f/20.0; Exposure Time: 0.013 s (1/80); ISO equiv: 200; Software: Adobe Photoshop CS4 Macintosh.